I have 10 single LED lights in my house. Each LED light is powered by an LED driver unit. By a process of elimination, I suspect the driver units are starting to fail. I have tried to find direct replacements on the internet, but I cannot. Could any of our electrically minded members point me in the direction of an equivalent replacement please? This unit is 4cm long, 4cms wide and 2cms deep. The 2cms measurement is reasonably important because these driver units have to fit in a recessed hole. 3 cms deep would be ok, maybe a bit more. These are units that can't easily be replaced. They are recessed aluminium lights that are set into the internal walls of the house. It would be a lot of work to change the units unless they were the same size and method of fitting. The cost is not so much the issue - it's more important to get the units working by replacing the drivers. Thai suppliers here: It seems they don't stock the same brand drivers but they should be able to offer a suitable replacement. Failing all that if you don't find a suitable replacement, it looks like that driver may not be a sealed unit. You may be able to have them repaired. I have had several printed circuit boards repaired over here. There are some very competent repairers who work on CNC PCB repairs. If the units are sealed you can still repairs them. I only mentioned this as you have mentioned the pain it will be replace the whole LED unit. If the driver is a sealed unit, you can dissolve the resin or plastic mold in a solvent which leaves the PCB. Then repair the unit and set it again in a resin. I have had some luck with doing that with old industrial computer components / CNC machinery parts that were no longer available. Maybe easier to shop locally and find lights which use the same driver/power supply. Quite a few LED drivers on Lazada. As usual, the search facility doesn't help to narrow things dow - but maybe worth a look. Specifications are rationalized. LED rating = PSU rating. What works for one will work for another. All you need do is open the box and read the labels. If the PSU rating is the same (or better) then you're good to go. Higher current rating will still work as it's current available. Not current drawn. Personally I've found Lazada to be lacking for technical data. In this case that's not correct. LEDs are current driven devices rather than voltage. The box is a constant-current supply (700mA) rather than voltage (which won't ever reach 9V - 6W white LEDs are about 4.5V). Find a 700mA driver with >9V limit and it should work. @blackcab I would verify the LED voltage and actual operating current on a working unit just to confirm the above. In the past I've found that the LEDs themselves have also failed along with the driver so it may be an idea to get a handfull of them too. Constant current, forward voltage and heat dissipation should be considered when driving LED lamps as their life depends on it. 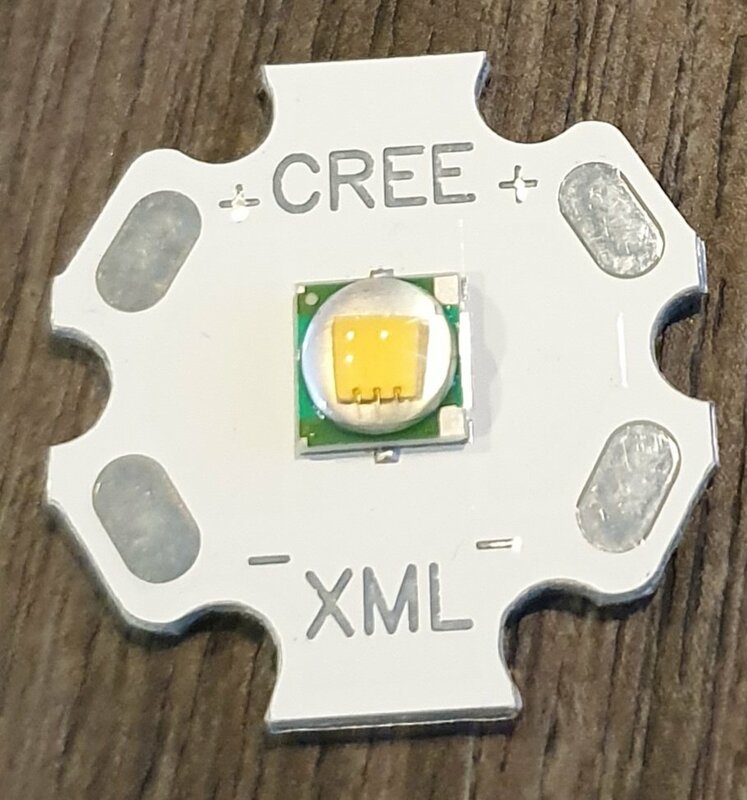 The OP's fitting and its Cree LED are most likely optimized in heat dissipation and driver selection to provide output value with decent life. I suggest sticking with the forward voltage and constant current selection which is driving at just under 7W and avoid driving with other values unless sure the fitting and its LED are suitable. 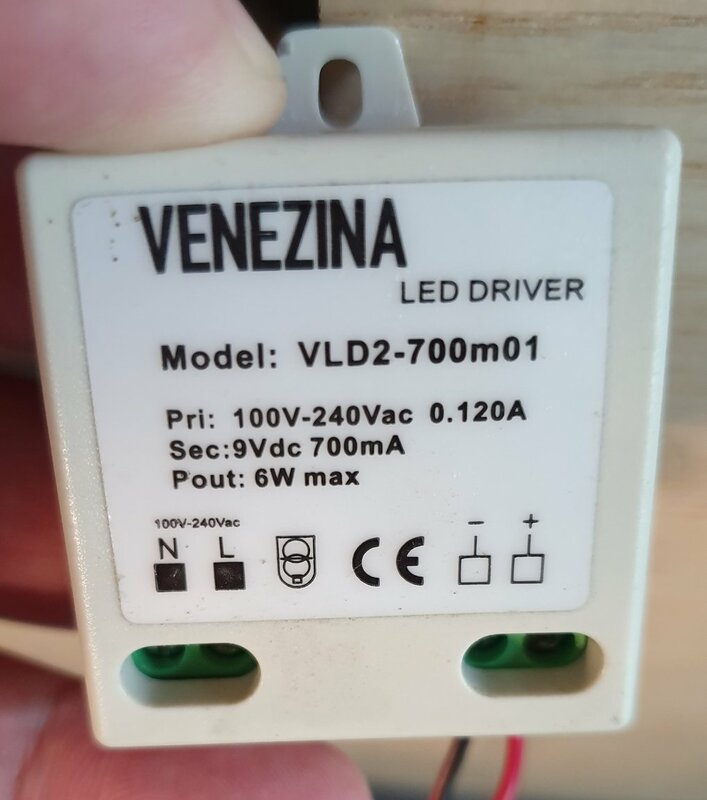 Here is Ebay listing for driver with same voltage and constant current values. Might be difficult to find with suitable dimensions. I assume LED chip failure has been ruled out by swapping drivers around. LED drivers often fail early when attached to the rear heat sink of LED light fittings and then exposed to high ceiling or roof space temperatures. I think I have a candidate. Would this be a suitable electrical replacement? (I have checked the physical size and it will fit in the recessed hole in the wall).